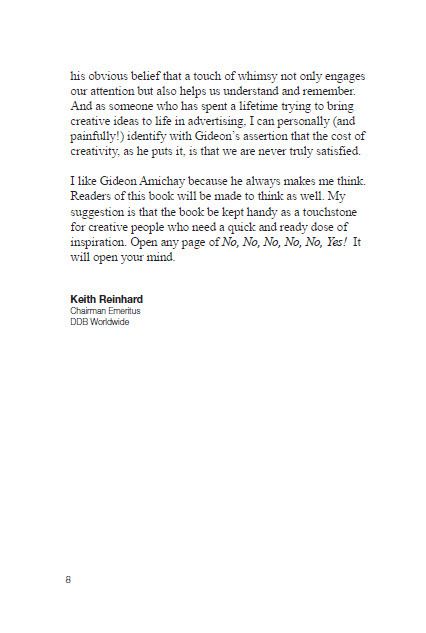 Keith Reinhard is Chairman Emeritus of DDB Worldwide and a legendary adman. I’m honored to have his introduction for my book. Thank you Keith. Gideon Amichay defies easy characterization. In appearance he is elegant and soft-spoken. His gentle manner gives no clue to the imagination that rages inside. His mind is a seemingly continuous eruption of original observations and surprising ideas – often brilliant and always provocative. Though Gideon is a native of Israel now residing in New York, he travels the world, and when asked where he lives, he answers: “I live on Earth.” He is a storyteller, an artist, an entrepreneur and a teacher. 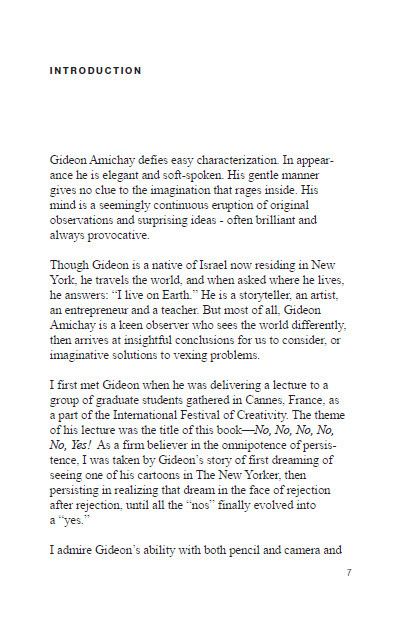 But most of all, Gideon Amichay is a keen observer who sees the world differently, then arrives at insightful conclusions for us to consider, or imaginative solutions to vexing problems. I admire Gideon’s ability with both pencil and camera and his obvious belief that a touch of whimsy not only engages our attention but also helps us understand and remember. And as someone who has spent a lifetime trying to bring creative ideas to life in advertising, I can personally (and painfully!) identify with Gideon’s assertion that the cost of creativity, as he puts it, is that we are never truly satisfied. I like Gideon Amichay because he always makes me think. Readers of this book will be made to think as well. My suggestion is that the book be kept handy as a touchstone for creative people who need a quick and ready dose of inspiration. Open any page of No, No, No, No, No, Yes! It will open your mind.